Well, at least the ingredients for it. 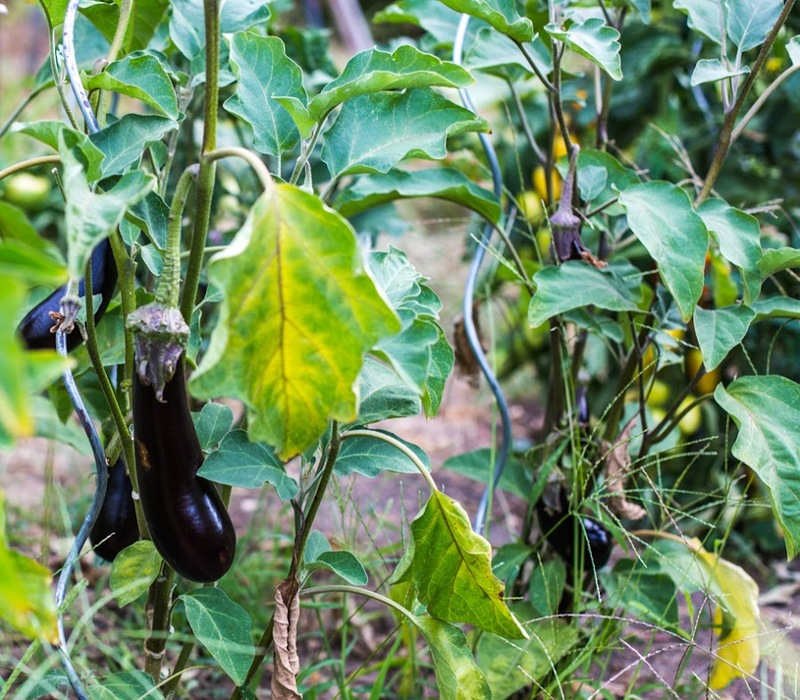 We have eggplant, tomatoes, zucchini, and peppers in the garden this year and they're doing fine. We've had better years, we've had worse years. Ken's planning to make a real ratatouille today for lunch. Aubergines, what we call eggplant, on the vine. This year is the first year in many that our eggplant have worked. For three reasons, I think. First, we bought plants from a local grower rather than planting seeds. Second, we raised the seedlings in the heat of the greenhouse tent. Third, the summer has been hot. Green bell peppers, still growing, still green. I want them to turn red before I harvest them. The peppers are the same. Bought, greenhouse, hot weather. Although we aren't harvesting them yet. I want them to go red, so they need more time. Tomatoes turning red on the vine. I've stopped watering them to encourage ripe and tasty fruit. 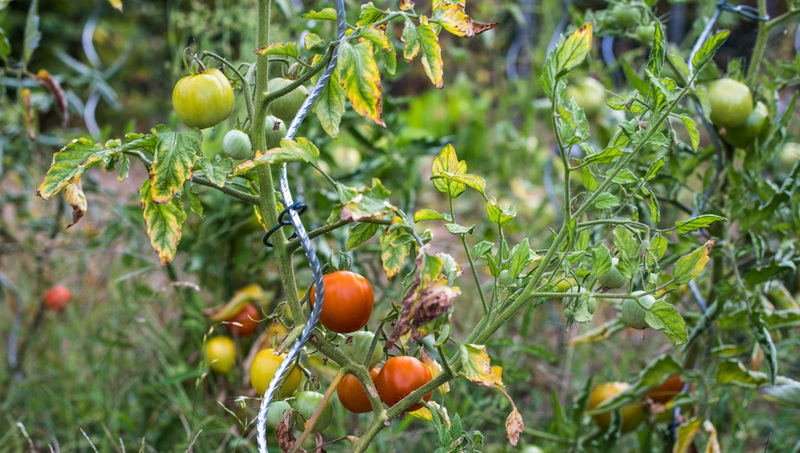 The tomatoes are late, but they're starting to ripen and we've been enjoying them for about a week now. It will be interesting to see how many we get, and how much tomato sauce we can make. It usually turns out to be a lot. These pumpkins may not be great, but they're the only ones I've got. 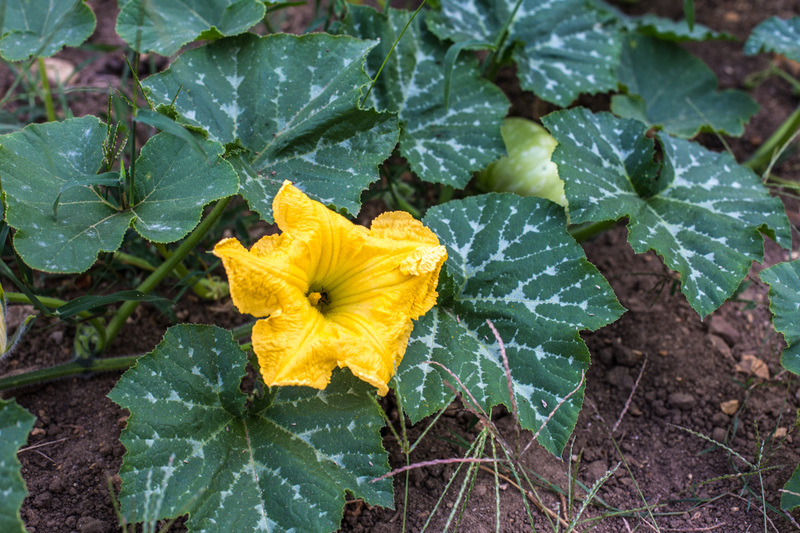 I planted two pumpkin vines this year; both are French varieties. The first is called Rouge Vif d'Etampes (vibrant red from Etampes) and the second is a courge musquée (musk squash). 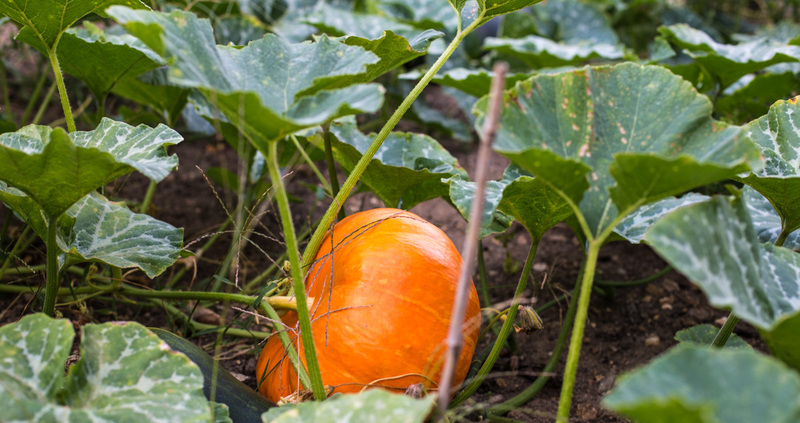 The vibrant red color should develop as this pumpkin ripens over the next weeks. So far, there is only one fruit on the Rouge Vif, although I did notice a second, smaller pumpkin on the vine yesterday. I'll see if it survives. The musk squash also has just one large fruit; a smaller one died on the vine a few weeks ago. A musk squash. It's supposed to turn a beige color (like a butternut) as it matures. One each is plenty for us since they're big. I also planted three sucrines (a type of squash similar to butternut) and they are producing a lot. Too much, actually. I still have processed winter squash purée in the freezer from a year, two, or three ago. 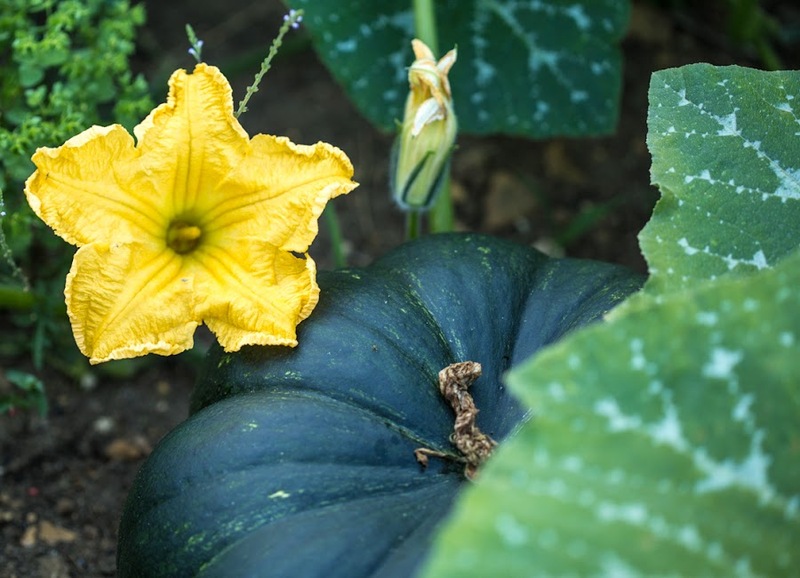 A squash blossom and a tiny green pumpkin under the leaves. I wonder if it will survive? Fall, and pumpkin season, is just around the corner. If the weather stays relatively dry, we should be able to enjoy pumpkin soups, pumpkin breads, and pumpkin pies for a long while. Ken grew two varieties of kale this year in our vegetable garden. One is called Red Russian and we've eaten a fair amount of that so far. The other is called Dinosaur, and we haven't yet eaten as much of that. Dinosaur kale in the garden. It's been harvested a time or two, exposing the stems at the bottom. Both types of kale make for beautiful plants in the garden. 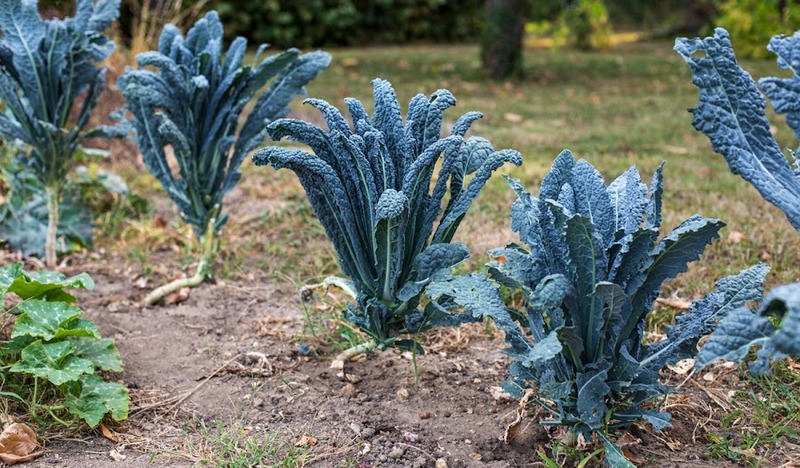 While both are green, the Red Russian has, unsurprisingly, a red tint to it and, as you can see in these photos, the Dinosaur kale is more blueish. 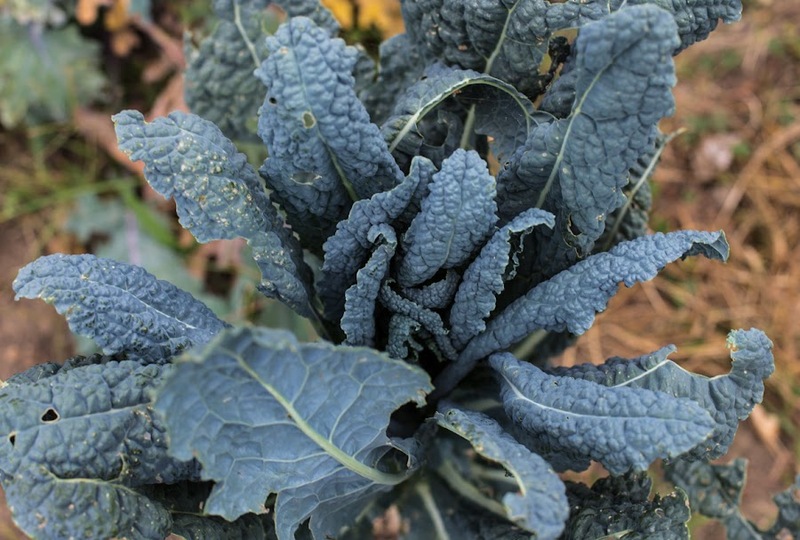 Where the Russian kale has broad, flatter leaves, the Dino's leaves are narrower and a little crinkly. Looking down at the plant from above. Ken has processed a lot of the kale into the freezer already, so we'll be eating it, along with collard greens from earlier in the year, all winter long. It's been a long time! Here's Callie as we made our way down to the river the other day. We crossed the main road safely and she was happy to be across. The speeding cars scare her, and I think that's a good thing. She waits for me to tell her that it's ok to cross. Callie turns to be sure I'm following. 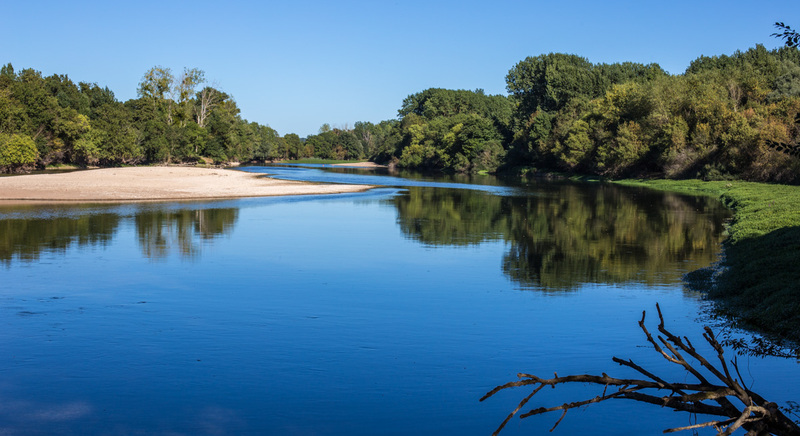 The river bank is at the end of this dirt road. Callie had her ninth-and-a-half birthday last week. In February, she'll be a ten year old dog. She's doing alright in the heat, still willing to go on her walks in the hot afternoons. But in the evening and at night she stays down on the ground level tile or on the travertine staircase where it's the coolest. Callie and I walked down to the river the other day. It's not a long walk. It takes five or ten minutes and we're there. The weather has been very hot, so it's not surprising that we saw people swimming in the river. The water level is low right now and there are many sand bars and beaches. A couple of guys fishing in the river with their dog. I'm certain that there are places where it would be easy just to wade across, although I have not tried it. The water is crystal clear, and you can see fish swimming very close to the shore. Callie surprised me and went into the water up to her belly. I took my shoes and socks off and waded in up to my knees. Very refreshing. Callie drank a bunch of water from the river. She's not at all a water dog, but all is fair when it's too hot! Another shot looking up river. Very summery. As close as we are to the river, we seldom go down there. Most of the time it's wet and muddy, so there's no reason to take Callie there. But it's different in summer and I sometimes forget that it's there. We should go swimming! This is what the grapes look like now. Some, not these, are starting to turn red. If I remember correctly where I took this shot, these should be red grapes. Either that or they're white grapes. LOL. My identification skills based on the leaf shape are not very good, but I don't think this is sauvignon. I don't think these are sauvignon grapes, so I'm guessing either gamay or cabernet. We're in a little heat wave right now. Sleeping is not all that comfortable, but it's not unbearable, either. The low humidity helps. All in all, our summer has been good, weather wise. Not like spring, which was a deluge. Man, it's hot. For us, at least. I figured that we haven't lived in a really hot (and humid) climate since we left Washington, DC, in 1986. That's thirty years ago. 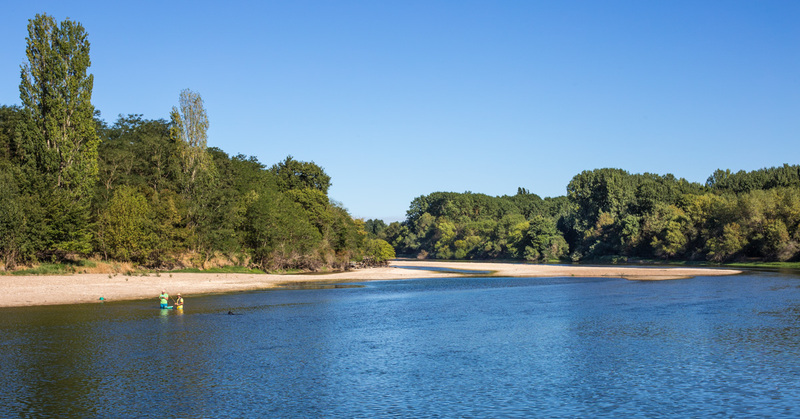 When we first arrived in France in 2003, it was the hottest summer they had had for ages. But not humid. We suffered temperatures upwards of 100ºF for weeks at a time, but it was dry Saharan heat like we're having now. I put our umbrella up on the deck to keep the table shaded when the sun shines. Since then, we've had some hot times and some not so hot times. LOL. But this summer has been very warm. It's nice, and we like it, but we're not used to it. Sleeping can be difficult, but again, we're not suffocating with humidity. Thank goodness for small favors. Each morning this week we open all the windows and doors to let the (relatively) cool air in. 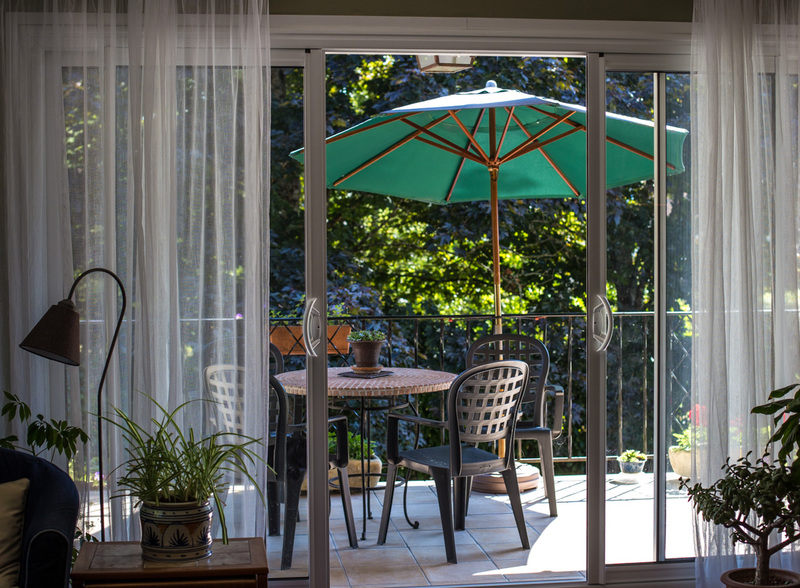 Then, as the day heats up, windows and shutters get closed to keep the sun and the hot air out. There can be a significant difference in temperature between outdoors and indoors when you do this, even in a less insulated house like ours. Now that I've finished with my travel photos, I have to get back in the habit of taking my camera out with me on walks. I really haven't given this new camera a workout yet. 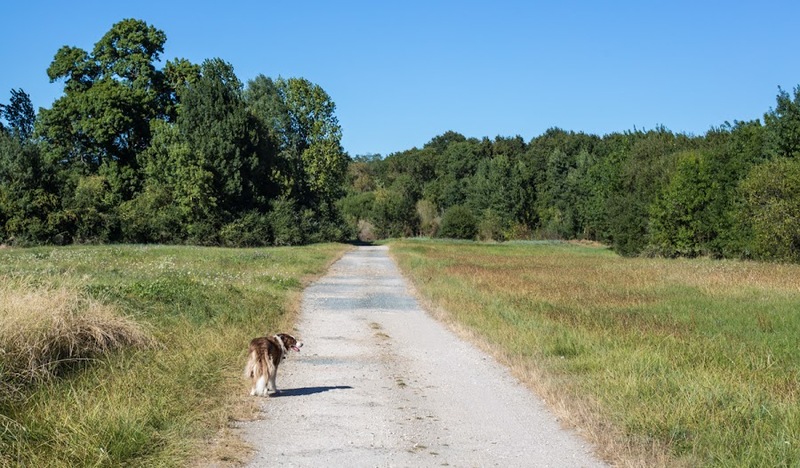 Since it's been so dry, I may venture down to the river (where it's usually muddy after rain) with Callie. This week is a hot one with no rain in sight. 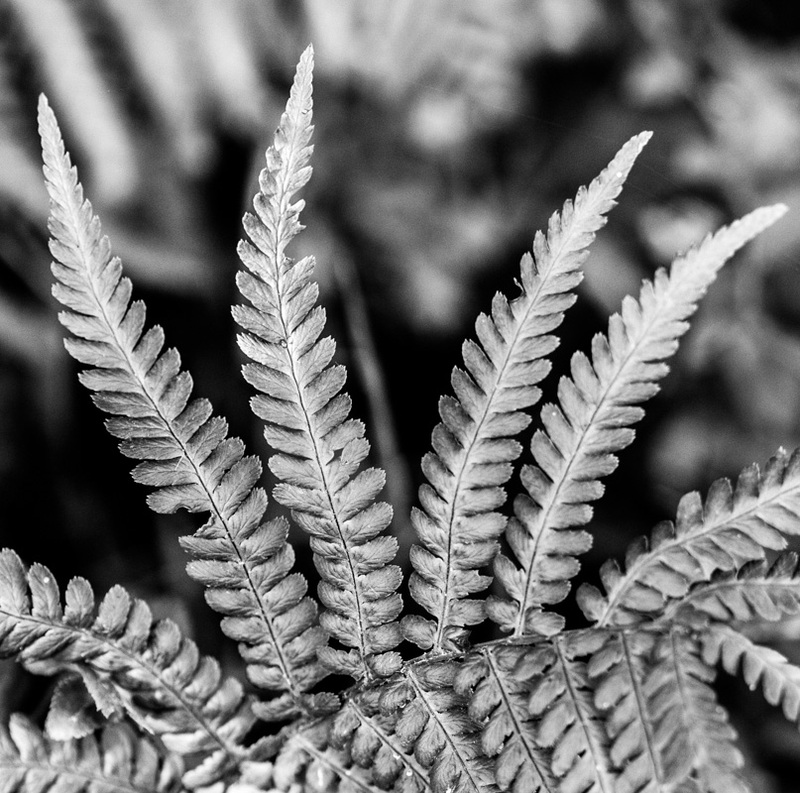 A fern in black and white. The grape vines are doing their thing and starting to ripen. The hot weather should help them along. This is the last full week of summer vacation for schoolkids here in France. The official first day back is next Thursday, September 1. This coming weekend will be very busy on the roads as people head back home from their vacations. This will be the last post from my trip to Canada and the US last May. At least for a while. I've been posting photos from that trip for over three months now. Jeez! Thanks for hanging in there. 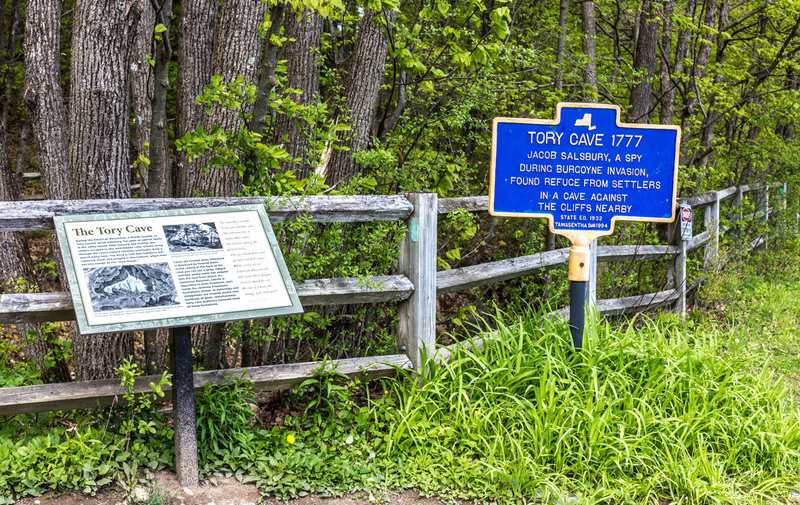 Interpretive signage near the western entrance to the Indian Ladder Trail. The Tory Cave is something that I vaguely knew about, but had forgotten. It's just a tiny footnote in the history of the Revolution, but given how few Europeans lived in this "wilderness" back in the late eighteenth century, it's interesting. "A little farther back, almost there, back just a little more..."
I don't know these people at all, but they were taking each others' picture as we walked the little bridge over the stream. 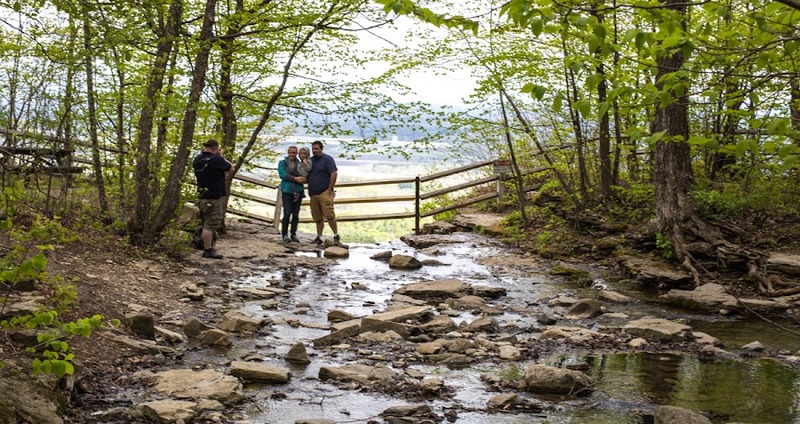 This is the spot where the stream flows over the edge of the escarpment to form Mine Lot Falls below. This is one of the many picnic areas that are set up around Thacher Park near the edge of the escarpment. In warmer weather, these places are filled with people enjoying barbecues, playing games (there are softball diamonds here and there in the park), and just hanging out. Someone must have been planning an event and set up this canopy, but there was no sign of activity. I was here in May and it was still too chilly for much picnicking. But it was still very pretty with all of the fresh green growth. 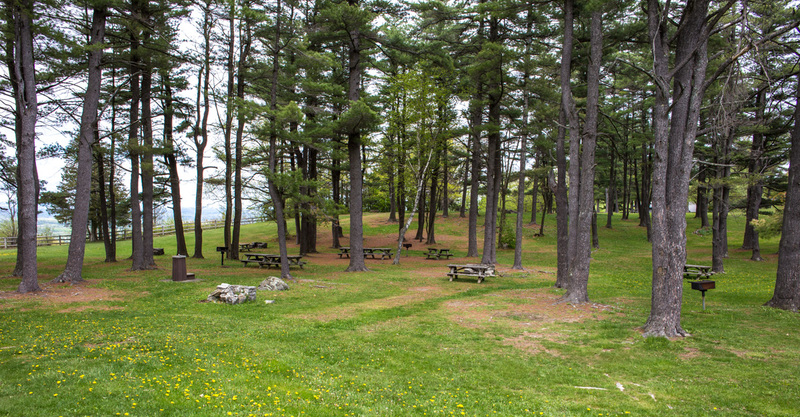 Picnic tables, barbecue grills, and water fountains nestled among the pines. 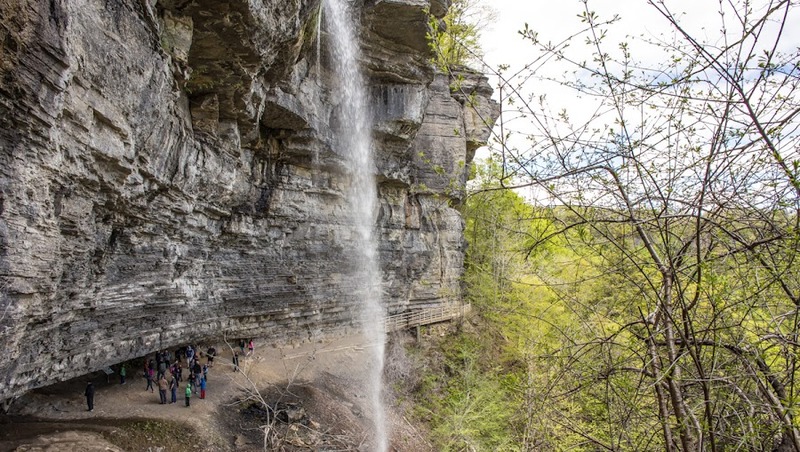 My friend L and I encountered a group of kids with adult chaperones at the waterfall. They lingered and we made our way past them. Otherwise, there were very few people on the trail, so it was a very pleasant walk. Part of the group ahead of us on the trail. 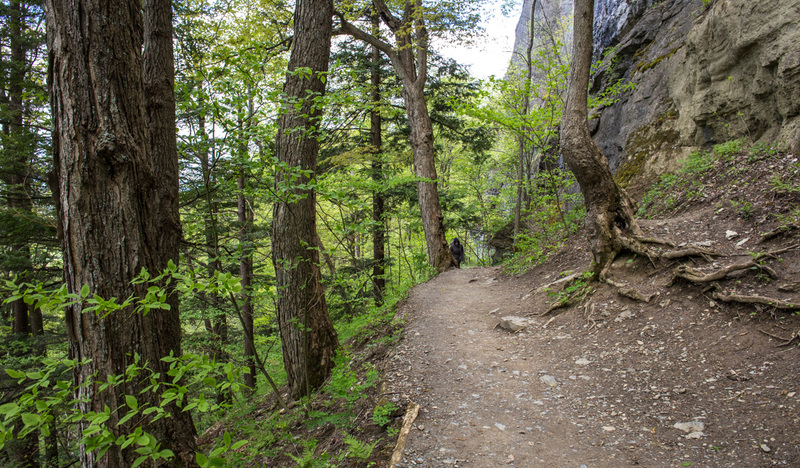 The well-worn trail with the cliff rising up on the right and the valley falling off to the left. More people on the trail near the waterfall. There can be more water than this tumbling over the cliff above the Indian Ladder, but this wasn't bad. I've seen Mine Lot Falls pretty dry in the past. Here are some views from my walk in May. Hikers gather below the fall next to where an underground stream exits the cliff face. Looking out toward the valley from behind the waterfall. Big blocks of rock fall off the cliff face at this spot, probably worn loose by the water. 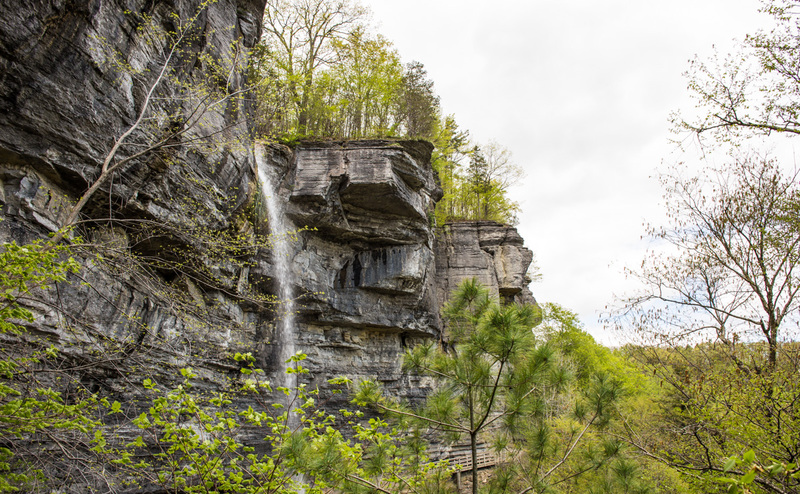 A closer view of the top of the fall. 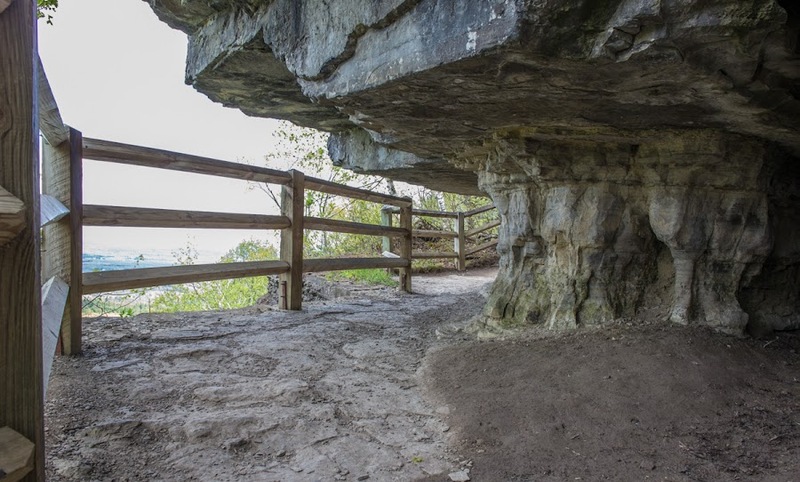 There are a few places along the Indian Ladder Trail where you have to crouch down to pass. This is one of them. Some parts of the trail are wide and not at all treacherous. Others, like this, are a bit more narrow and scary. But at least there are fences to keep you from falling. I exaggerate, but there are places where people do fall and hurt themselves. You have to be careful. The walk is not strenuous at all. Except that the stairs at either end can be difficult for people with mobility issues. I'm glad that I can still negotiate it all because there will come a day when I won't be able to. When that day comes I will be glad to have my photos. The sign says it all. 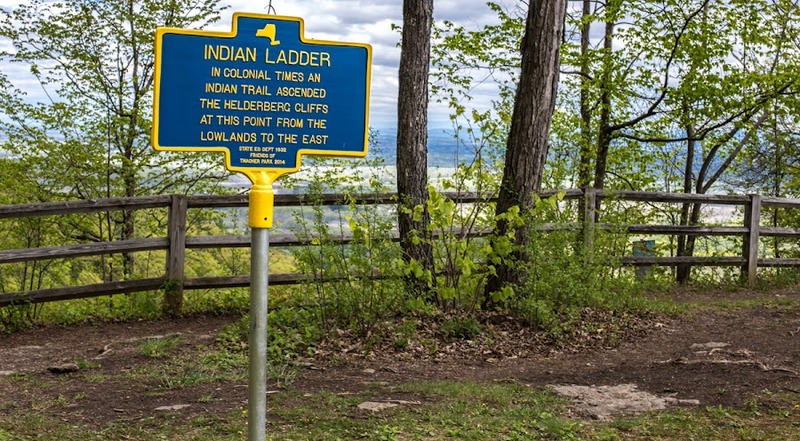 A portion of the Indian Ladder was incorporated into Thacher Park in the 1920s and has since been improved for tourists. I've walked the trail more than a few times over the decades. 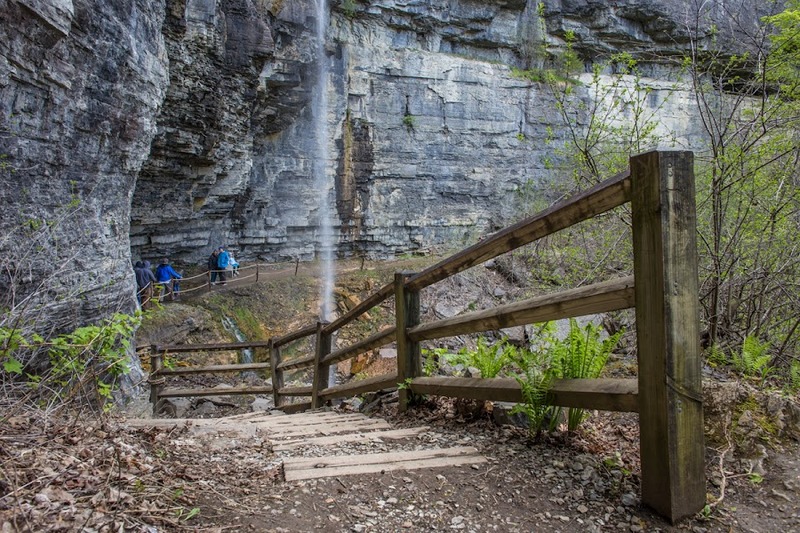 On either end are steel stairs down to and up from the trail which hugs the cliff face. 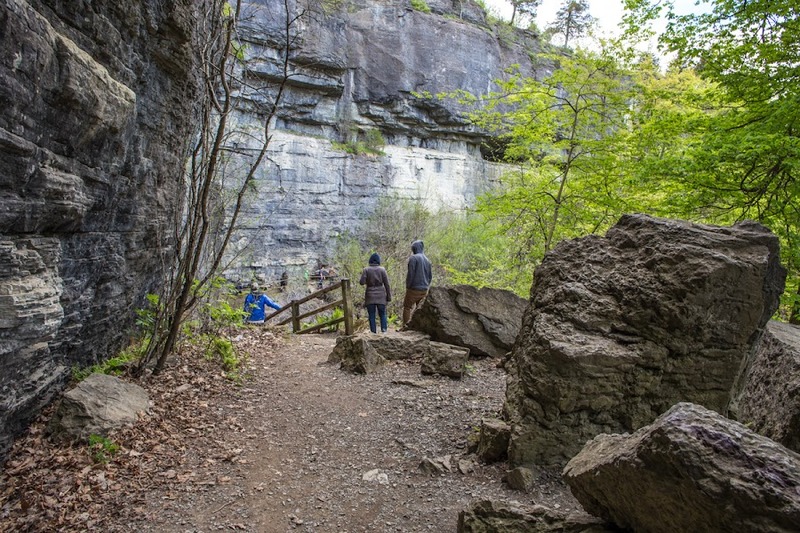 Along the trail are caves and outlets of underground streams; at one point the trail winds behind a waterfall that issues from a stream in the park above. We were lucky to be there in spring when there was plenty of water. This time of year the stream can be reduced to a trickle or even dry. But I'll get to all of that later. This sign is near the western end of the trail and the new visitors' center. After these next few posts, I'll be done with my vacation photos from Montréal and New York. 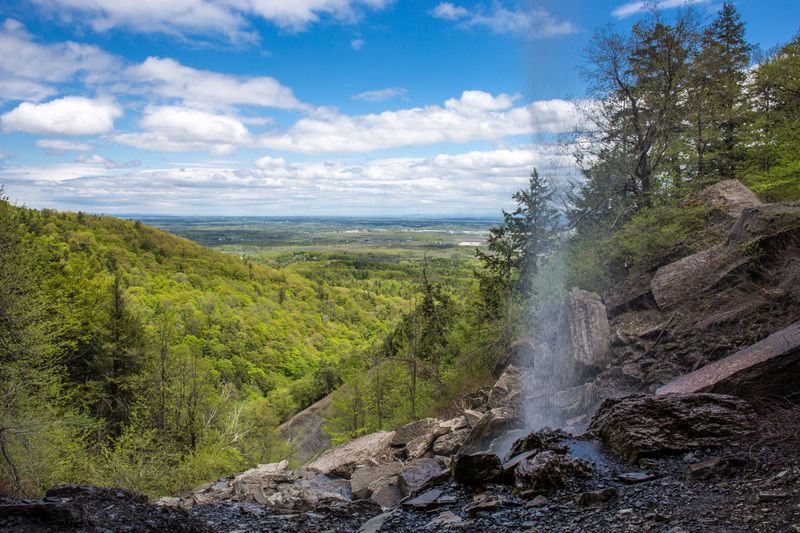 Yesterday's views of the Helderberg Escarpment were looking east. Today's views look the other way. A trail makes its way along the cliff edge through most of the park. Another trail descends the cliff face (more about that later). 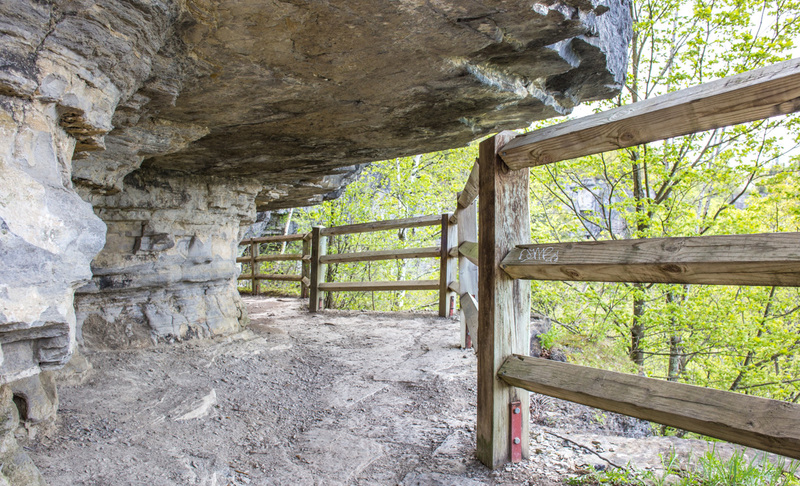 This section of the cliff-side trail has a fence to keep hikers from tumbling over. There are other trails in the park through the forest up into the hills behind, and numerous picnic areas, however overnight camping is not allowed in the park. There was once a large public swimming pool, but it was closed in 2007 and completely removed a few years later. The visitors' center construction site is visible just to the right of center. A new visitors' center was under construction in the park when I was there in May. You can see it in these photos if you look very closely. I wonder if it's open yet? 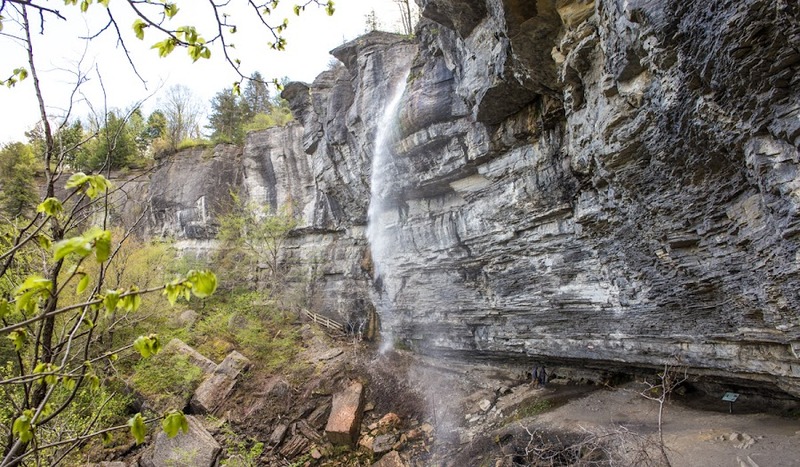 The northernmost limit of the Catskill range ends in what's called the Helderberg Escarpment. Below it lie the western side of the Hudson Valley and the southern limit of the Mohawk Valley. 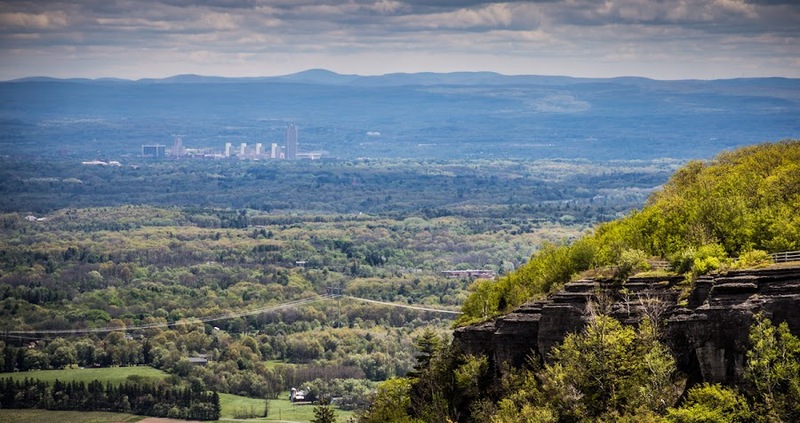 Albany in the Hudson Valley seen from Thacher Park high on the Helderberg Escarpment. The Taconics and Berkshires rise just beyond. Massachusetts is to the top-right, Vermont is to the top-left. 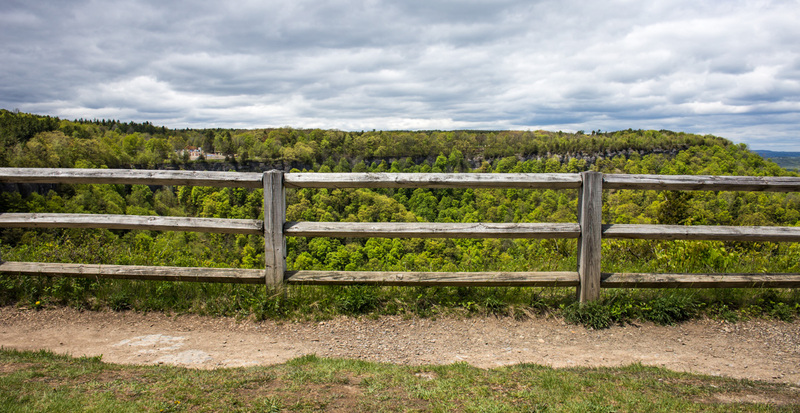 At the top of the escarpment is the John Boyd Thacher Park, overlooking the valleys and the mountain ranges beyond. 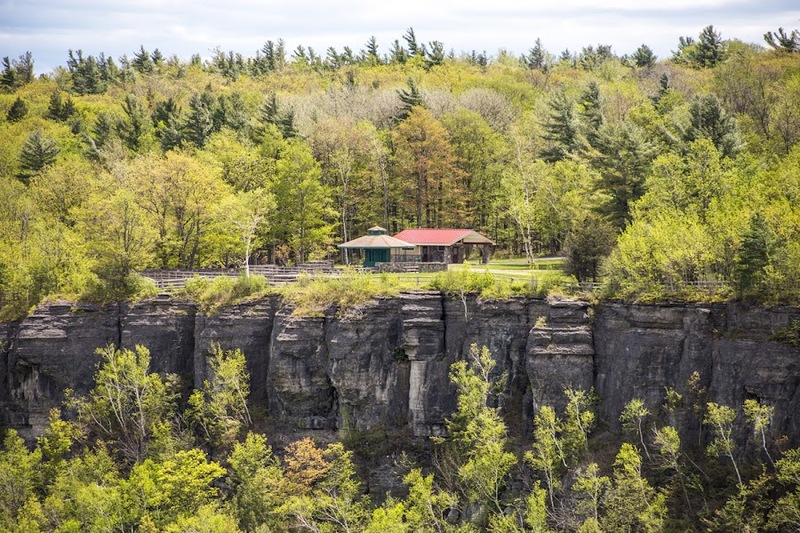 East of the city of Albany are the Taconic Mountains and the northern reaches of the Berkshires. Northward are the Adirondacks. To the northeast, the Green Mountains of Vermont. The Catskills are to the south. A picnic area on the edge of the escarpment in Thacher Park. I spent a lot of time in Thacher Park and the area around it while growing up. There's a lake not far from where I took these pictures called Thompson's Lake. My family went camping there during many summers. I remember one summer in particular, August 1974, when we were camped at Thompson's Lake. The entire campground listened to Richard Nixon's resignation speech. You could hear it echoing through the woods just walking around. Nearly every radio in the campground was tuned in. I was fourteen years old. Our vegetable garden is going strong, thankfully. We're harvesting green beans like there's no tomorrow. Next year I will plant shorter rows in an effort to space the harvest out more. The zucchini is producing well. And I know now that two plants are enough for the two of us. One of the pumpkins. It won't be ready until it turns orange/beige. The eggplants and bell peppers are making fruit, although harvest won't be for another few weeks. 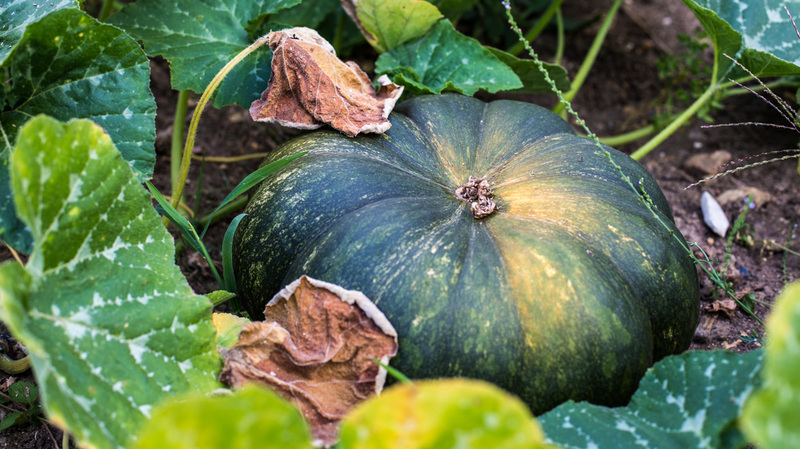 The winter squash, two kinds of pumpkins and a local variety of squash that resembles butternut, are doing their thing. They'll be ready around the first of October, I think. Tomatoes just starting to show a little color. And the greens! We have lots of kale and chard. More than we can use, of course, so much of it is going into the freezer. Then there are the tomatoes. 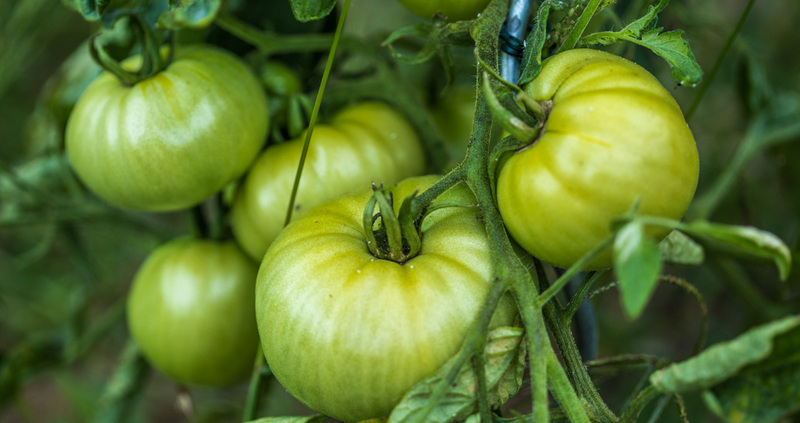 The plants have produced a good number of green tomatoes so far. 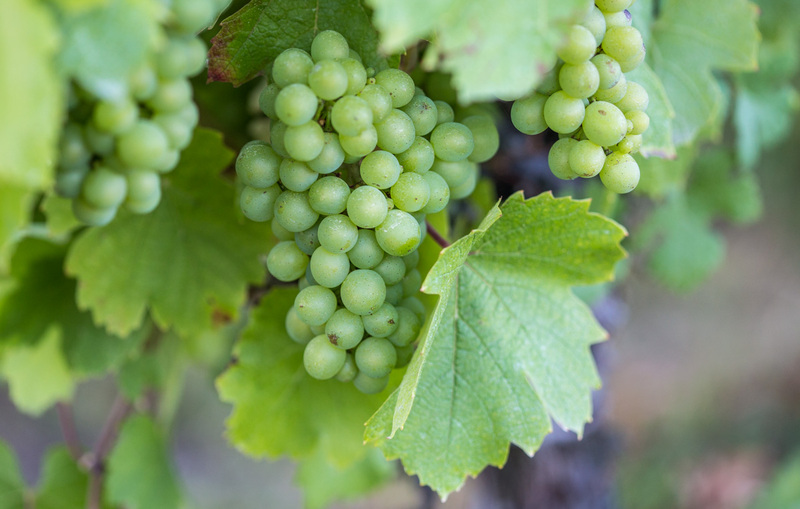 We're waiting for the ripening. These hot days should help that along nicely. The major disappointment with the museum was that most of it was closed due to the installation of a new exhibit. We got in at a reduced price and were able to see the art in the new wing. 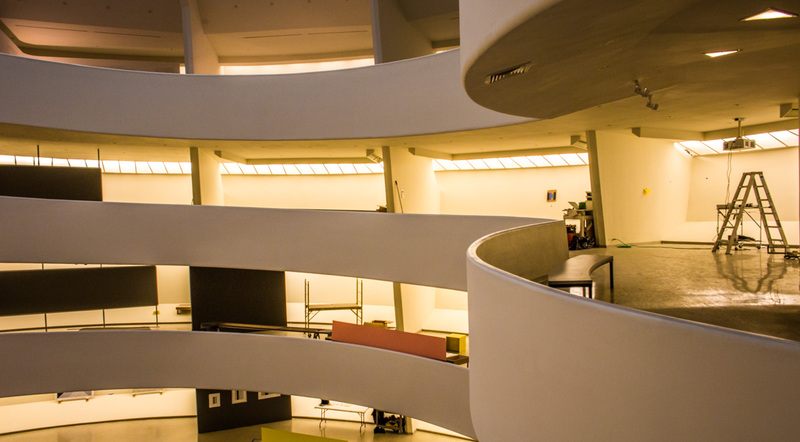 But the main spiral ramp inside the iconic building was roped off. Still, we were able to view the space from the main floor and from each successive landing where the two sections of the museum intersected. Here are a few of my impressions. A museum worker on the ramp. I took no photos of the art we saw, and we saw plenty. I was a little disappointed not to be able to walk the ramp, but I'm glad I got to see it at any rate. Maybe on my next visit! An incredible volume created by the architect. After the Guggenheim, my friend L and I walked a few blocks down Fifth Avenue to the Neue Gallery to see Klimt's The Woman in Gold. It was amazing. The gallery also had Munch's original The Scream, a very small pastel, not at all as I imagined it to be. Photos were not allowed inside the gallery. 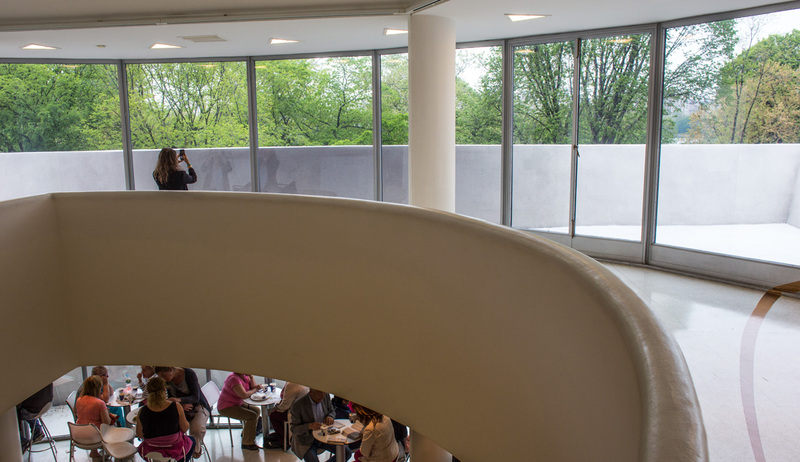 The level above the museum's café, looking out over Central Park. Then we got back on the subway to Grand Central Station, where we shopped at the NYMTA museum store. I found what I was looking for: a mouse pad with the NYC subway map printed on it. Next, we decided to walk down to Penn Station to get the train for our trip home. Along the way we stopped at a wine bar called Madison and Vine, predictably on Madison Avenue, for a glass (or two in my case). The weather was drizzly, but the city was sparkling and it was all great fun. The wine ensured that I napped a little on the train ride back to Albany. 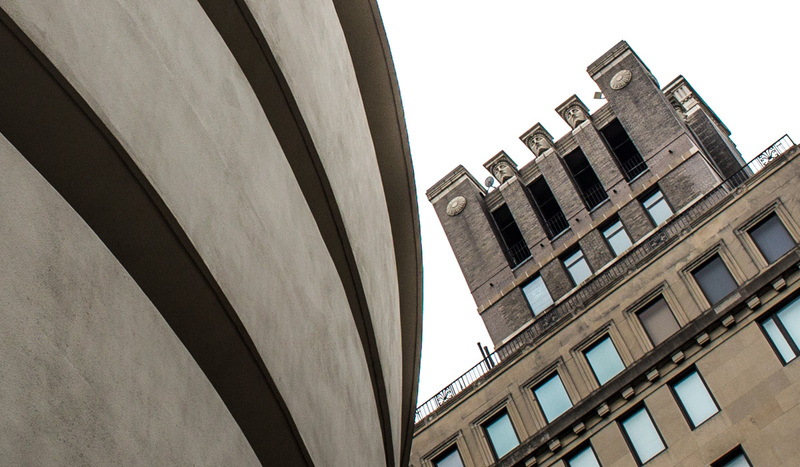 Here are a few more shots outside the Guggenheim Museum on Fifth Avenue in Manhattan. I walked around a little for different angles. It's hard to get it all in, of course, even with the wide angle lens. And "clean" shots (without cars, traffic lights, and other bits of real life) are nearly impossible. At least for someone like me walking around on the street. A neighboring building had some very interesting sculpture at the top. The view from 5th and East 88th Street. The view from 5th and East 89th Street. 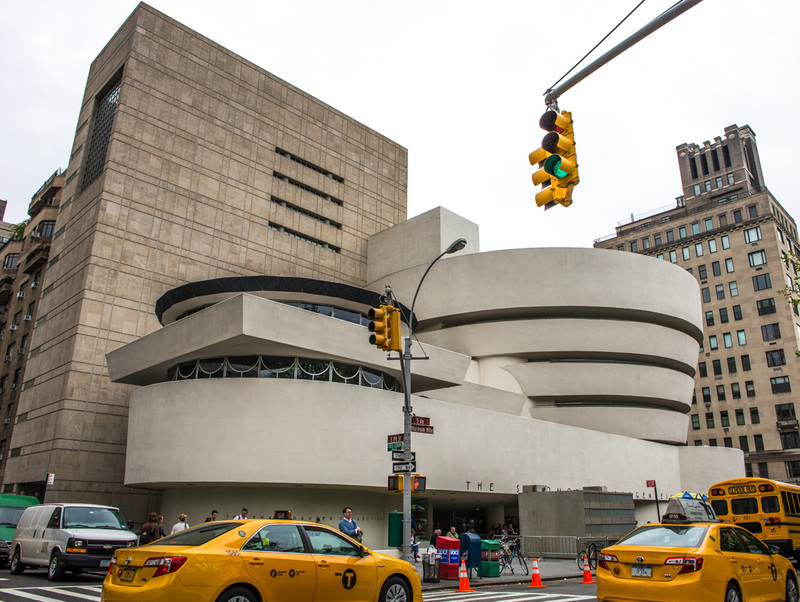 The large rectangular building that rises up behind is the museum's "new" wing, completed in 1991. 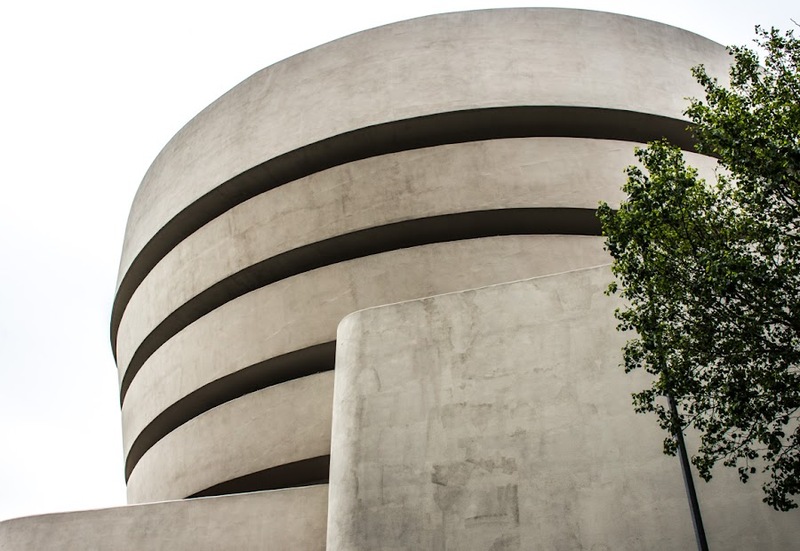 After our wonderful lunch, L and I made our way over to the Guggenheim Museum. There was a line to get in, but it wasn't very long. As we waited, I took the opportunity to take some pictures. 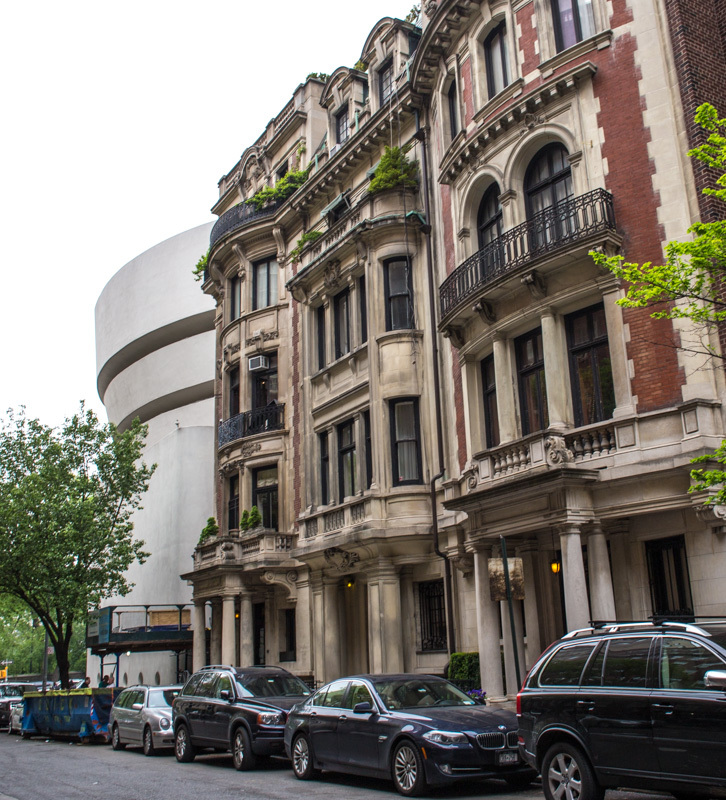 My first glimpse of the famous museum as we approached 5th Avenue along East 88th Street. It turns out that the Guggenheim Museum was opened in this building in 1959. That makes it exactly my age, as I was opened in the same year. A couple views of the museum building from the outside. 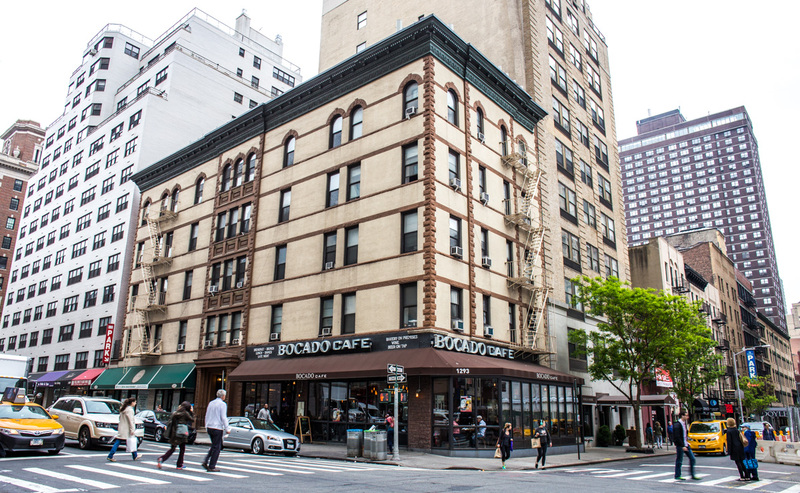 The restaurant that my friend L and I found is called the Bocado Café, on the corner of Lexington Avenue and East 87th Street. It looked very inviting, the menu looked good, and there were plenty of tables available (it was just before the lunch rush). We sat in the window on the 87th Street side. The Bocado Café and Wine Bar on Lexington Avenue. I highly recommend it! I ordered a glass of white wine. I've forgotten now which wine it was, but it was probably a California chardonnay. My friend L had a glass of sparkling prosecco, another recurring theme during this trip. 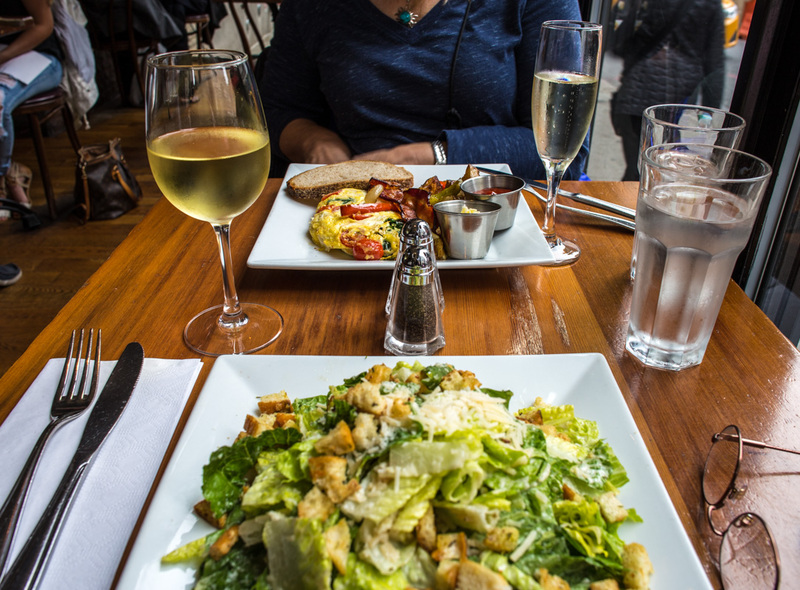 Lunch was a delicious Caesar salad for me, and L had a wonderful looking omelette. It was a perfect meal and we were happy. We were soon off to the first of two museums we would visit that afternoon. Inside the restaurant with the wine bar at the back of the photo. 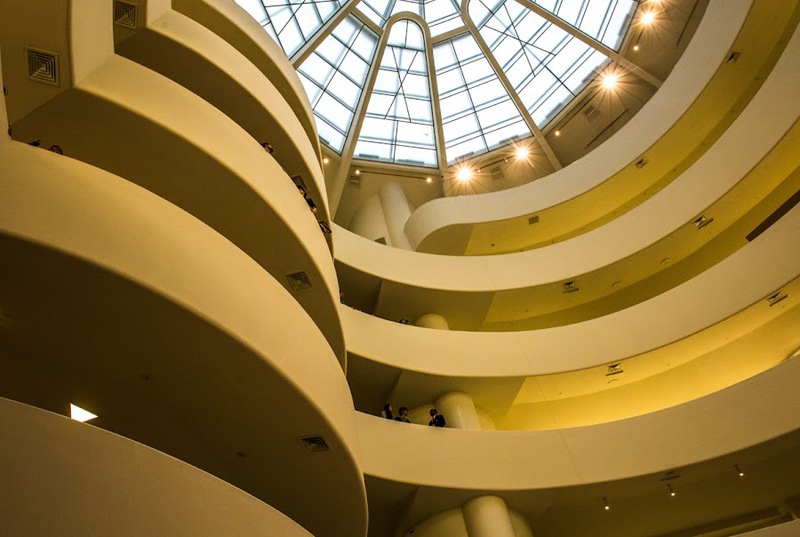 Another thing that I really wanted to do on this trip was to visit the Guggenheim Museum in New York City. 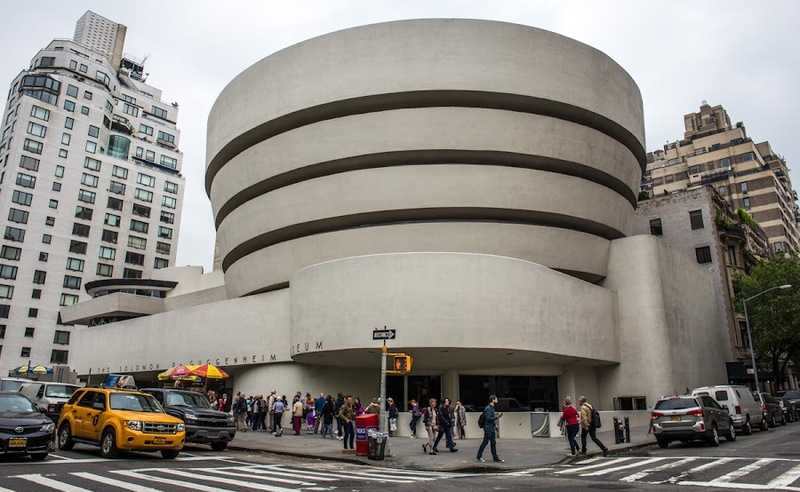 I had never been there and, as a student of architecture, I had always wanted to see Frank Lloyd Wright's Manhattan masterpiece. 87th Street at Lexington, from inside the restaurant we found. So I asked my friend, L, if she would be interested in going. She was enthusiastic. We took the train from Albany down to New York, a two and a half hour ride into Penn Station, one Friday morning. On arrival, we hopped the subway to the upper East Side hoping to find a good place to eat lunch before going to the museum. A view down Park Avenue. 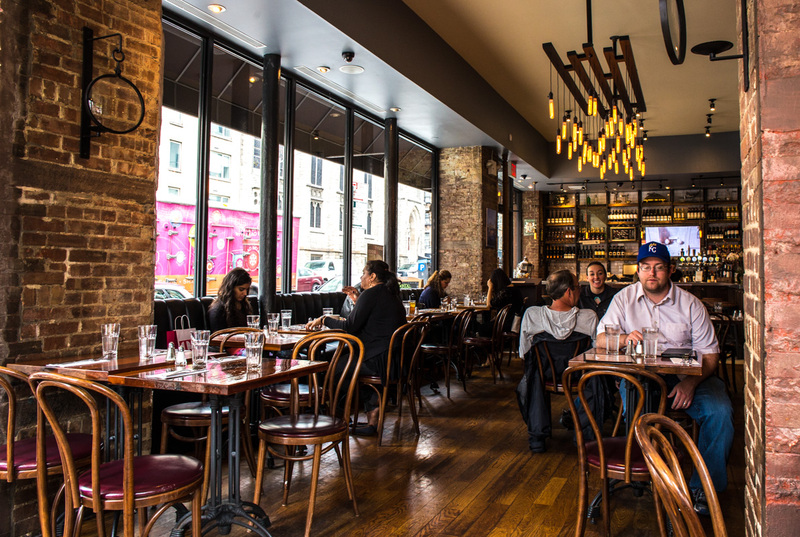 The swank upper East Side. 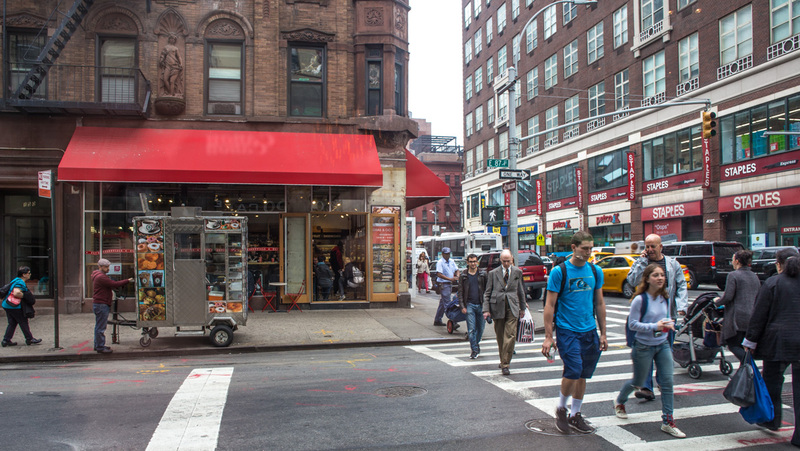 We got out of the subway at 86th and Lexington and started walking north. Within a block we saw a place that looked inviting for lunch and in we went! One of the things I wanted to do while in Albany was to visit Troy, a smaller city just north and across the river. My plan was to spend a morning or afternoon walking through the historic downtown taking pictures, but I never got it together to do that. Behind the bar at the Lucas Confectionery. Still, I managed to get to Troy three times for fun. 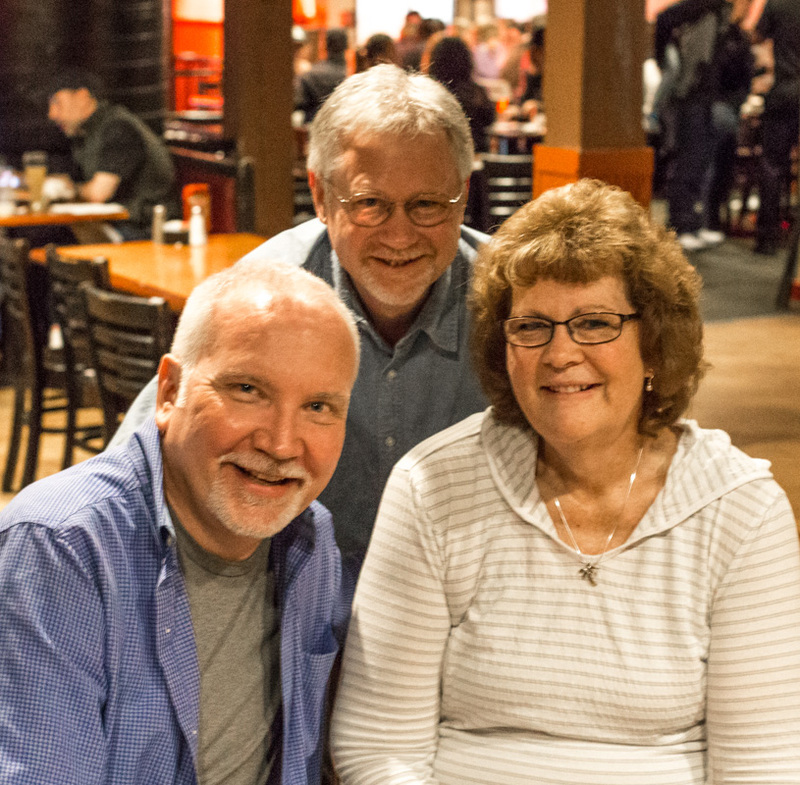 The first time, I had dinner with a high school friend, her husband, and their daughter at a downtown brew-pub called Brown's Brewing Company. It was great to reminisce and enjoy the local beers together. I had a tasty cheese steak sandwich with fries and a couple glasses of Brown's pale ale. Yum! At Brown's Troy Taproom with J & L. Photo taken with my camera by their daughter, J. 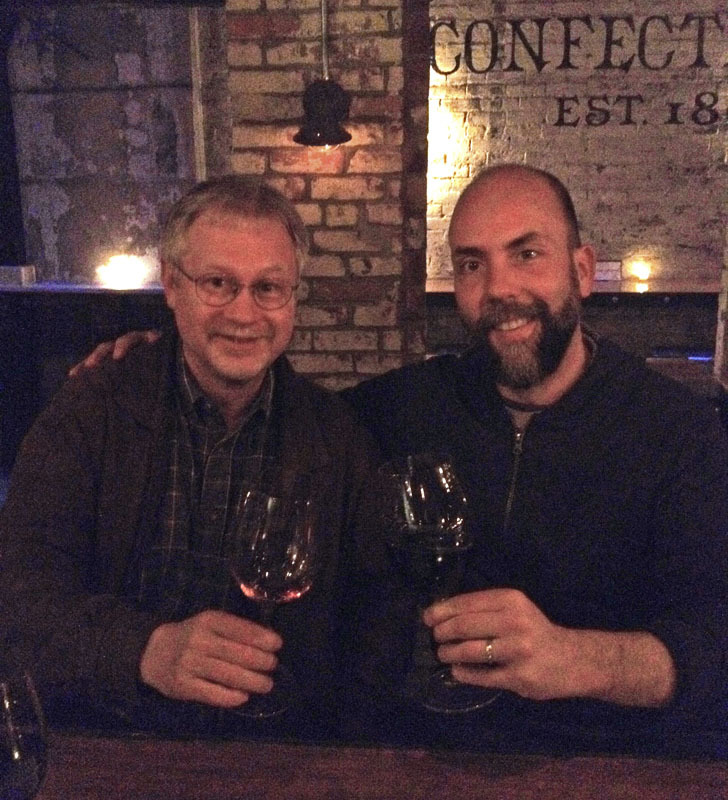 My second trip to Troy was to meet my cousin in a downtown wine bar called Lucas Confectionery. Again, I had great fun catching up with M. I last saw him in 2012. The bartender was friendly and informative and, in addition to the wines we ordered, he offered us tastes of several more, along with stories about the wine makers. Me and my cousin M. enjoying wine at the bar. Photo taken by the bartender with M's smartphone. 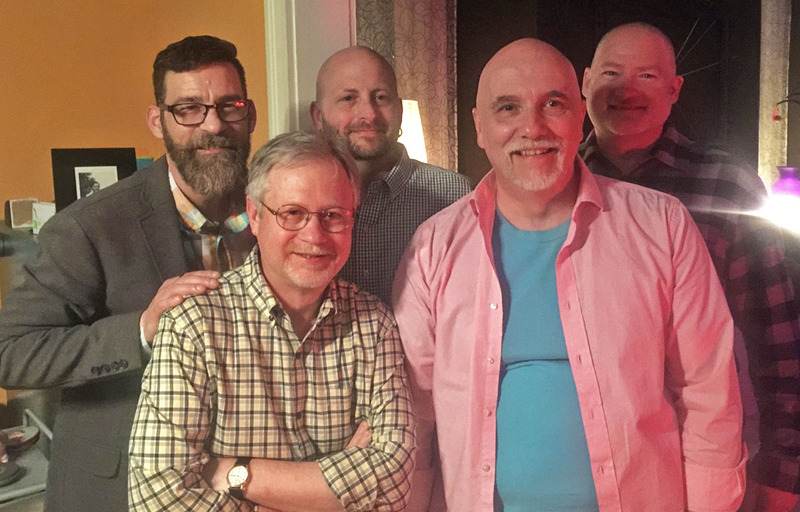 Lastly, I enjoyed a dinner party with blogger and facebook friends at their home in Troy. There were six of us all together, and we enjoyed wine and a home-made beef stew with carrots and potatoes, a terrific mixed salad, and vanilla ice cream with a raspberry coulis for dessert. Scrumptious! After dinner at the home of J&F, with S&J and J (who's not in the photo because he's snapping the picture). 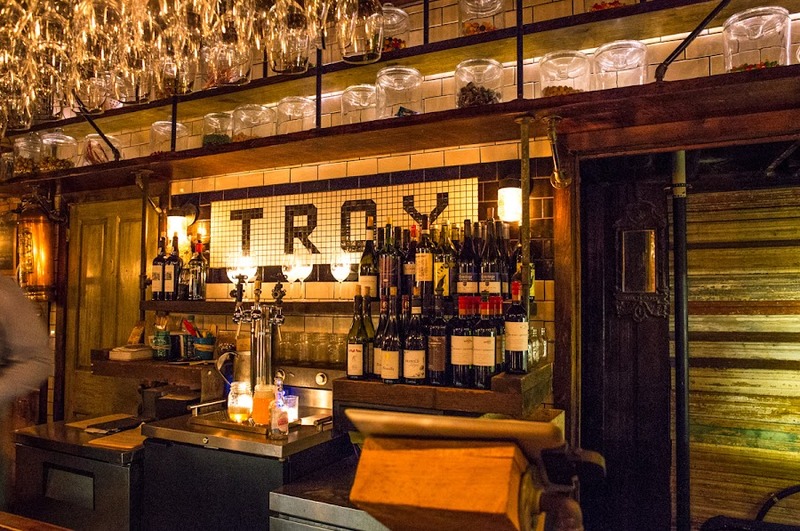 So, maybe I'll get to wander around downtown Troy on my next trip!